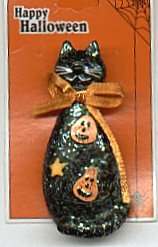 This ceramic cat Halloween pin features a black cat. This cat has an orange bow and is decorated with pumpkins. 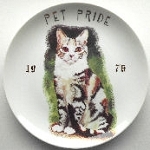 This cat pin is 2 1/2" high x 1" wide.